I will start at the top! This is where my bedsheets are located, together with some dull trousers I still have to change into shorts.. Here are my tights and sweaters. I barely wear sweaters, only if I'm soaked wed due to an unexpectant downpour. That's why they are a sort of hidden; I don't use them very often. However, my tights I use everyday! My favourite part! 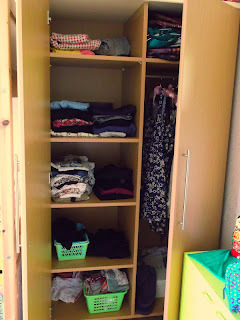 This is where my dresses and very thick cardigans are located. Do you see the light-pink jumper? It's so ugly I am never ever going to wear it anymore, but it contains so much memories! My grandma bought it for me and back then I wore it a lot. It's so warm and so comfy, but again, absolutely plain. That was my closet! (: Now I'll show you my favourite items, sorted on category. This one was my very first selfmade skirt and I love the fabrics! It seems a little strange on the picture but in real life is much cuter! It's easy to combine and it's my first Primark purchase ever. As I told already, I only have two pairs of trousers and one is hard to combine. The other one is a tan skinny from H&M and I think it's extremely pretty. This black, basic cardigan with pockets from Primark is definitely my favourite. It's cute and fits with every dress and skirt. Besides, it's so comfy I wish I could wear it everyday! This is my favourite belt. It's a brown one from H&M and I love it so much. It fits, just like the cardigan, with everything. These tights from the Wibra are very cheap (50 cents each) and their quality is okay. It's not stunning but you can't expect any more for that price! Well, this was a pretty long post, but I hope you still enjoyed all this! Kledingkast opruimen is bij mij altijd een dagtaak haha! Leuke items heb je er uit gepikt! ziet er goed uit! mijn kast ik zo leeg en rommelig vergeleken met jou! it certainly does look a lot more organised =) good work! i should clean out mine because its a mine field at the moment teehee! Leuk om te zien, goed opgeborgen allemaal. Je hebt echt leuke printjes hangen ! Leuk om te zien !! Leuk! mijn kast heeft ook echt een make-over nodig! Leuk om te zien, sowieso een leuke blog. Superleuk zo'n kijkje in je kast! Je favo rokje is echt cute =) en die broek van H&M ziet er inderdaad ideaal uit, enig idee of hij nog te krijgen is ;)? Wat heb je leuke kleding! Om eerlijk te zijn, heb ik geen jurkje in mijn kast hangen... schaaaam! Ik vind de close up foto van je jurkjes heel leuk (: Liefs! All that's waiting is regret. I'd like to be, under the sea. Till I can make it on my own. a bed of grass, a soft green pillow. deep in the meadow, under the willow.